Guilford Grammar School is a boys only school in Western Australia that, from 2018, will be co-educational. In line with this change, the school needed to add a uniform for female students. Guildford Grammar headmaster Stephen Webber said the extension into co-education gave the school the opportunity to review and modernise its uniform. “It really was a pretty straightforward decision for us to provide the options. It made sense,” he said. 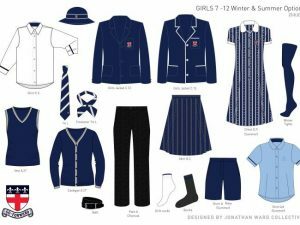 Renowned Australian fashion designer Jonathan Ward is the man behind Guildford Grammar’s new school uniforms. “I think the most important point is that schools are starting to realise and understand that students of today have many different requirements and opportunities than students 20 years ago,” Mr Ward said. Guildford Grammar are leading the way in providing a comfortable and modern uniform for all students, that allows girls to choose from a range of suitable options, including shorts and pants.